Danielle Holm’s “Dear Zach” Message! – Kent Hovind v. Robert Baty – The Great Debates! Home→Danielle Holm’s “Dear Zach” Message! Danielle Holm is the mother of “Baby Holm”, which involves a developing story covered in a number of related articles on this website. Melissa Griffith is a citizen of Cleburne County, AL where the Baby Holm story has developed and has an opinion about the case that differs considerably from that of Danielle and her husband C. Clarke Holm. 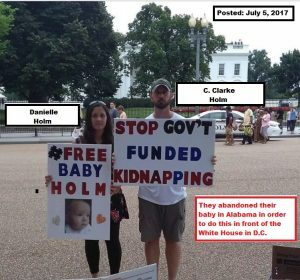 C. Clarke & Danielle Holm and their supporters have a number of venues where they promote their false narrative against child welfare agencies, their employees, the Government in general, and persons who do not agree with their views. I have debated about whether or not to post this, but have decided why not. This is a message that my son, who is a minor, received from Danielle. I have edited the post to remove some hateful statements directed toward Jeanne Stewart and Veronica Cucinotta. They’ve been through enough without rehashing the lies Danielle has told about them. You are a nice boy and I wanted to reach out and thank you for being kind and considerate enough to stop and meet Christian and I in person, yourself rather than further perpetuating hate on strangers you’ve never met. I continue to be baffled at the level of treatment we continue to experience by your guide in life, your mother. I am sorry that your guide in life teaches hate, judgement and persection in a world where we are supposed to be Christlike and show love and compassion to all life. Your mother continues to ridicule, mock, spread lies about us based on hearsay information by those who continue to lie about us all because they are afraid of the truth of what has occurred in our world and in heflin. Although I understand the principalities of darkness we are currently facing, and I have been trained my whole life to overcome it, it doesn’t make it any easier and it surely doesn’t make the hatred aimed at our hearts less than mind boggling. We were simply 2 people experiencing life, not hurting others, not hindering others, taking nothing away from the lives of others when we were maliciously attacked, had our baby violently ripped away from us, and we continue to be maliciously slandered, mocked, laughed at, falsely accused, cyberstalked, harassed, threatened, and and so on. Your mother continues to be one of the top contributers of that which I don’t quite understand because looking at pictures, it seems as though she has a nice family. The only thing that ever keeps people in a constant state of hate against others is fear. A lack of content in the Creator. This is why most bullies, bully. Christian his entire life stood up to those bullies to help the less fortunate who would get bullied, and now he is the one attacked, as am I. Because our baby was stolen from us. An extension of MY body, and Christians DNA which the Creator gave to US and only us to create together through love, to then guide and watch grow. Everything has been stolen from us. Because someone else thought they should have our baby more than us. That is barbaric, inhumane and disgusting to me. And whats even worse to me is that then, on top of all our pain, a group was started by a former IRS agent who is paid to denounce, discredit and shame those who “could be” a threat to the economic system. And people are going along with it. Including your mother, my mother, my sister, etc…its mind boggling the amount of hate these individuals have within themselves and they are taking it out on a family already going through enough pain. The false who projects onto others exactly what it is battling with internally. Which is why I believe your mother may have been a victim of hate aimed at her heart which is why she goes out of her way to do that to us without even knowing us or having ever met us in person. I also feel she is in fear that if our case gets blown open, as it should that other cases will as well and being that she’s adopted kids, she is afraid of losing them to their mother and father. That is something I don’t know for sure, as I do not know the story of the adoptions and where their mother and father are, but I only presume that could be a fear of hers. I guess I am just trying to understand her motive and agenda and to reach out to you, because I hope you see the wrong in this situation. Its never right to bully anyone or be of hate and mock, slander, commit defamation of character. Its right in every situation when living for Christ, to love unconditionally, offer help, support (as long as they are not hurting others) and to be kind and patient. It has taken Christian and I many years to become fully content within God and we still have more growing to do, but we could never treat people the way we have been treated by those in heflin and our own families. We just don’t have it in is. We feel your heart and we sensed compassion within. We pray you hold onto that, as it is the only value in life above all else. Let me clear the air on the matter of my support on C. Holm and D.
I do wish that they would take the proper measures to regain custody of their child. I do not however support their decision to not comply and leave they state. I am 17 years old and received a message from D Holm when I haven’t stopped to check on them since early April. I agree that DHR does need reformed in fact I despise a certain worker. This does not mean that I support their decisions. That doesn’t automatically mean that I am 100% on their side. Thank you for allowing me to clean the air. Come come, come out, Danielle Holm. We have things to talk about. Or send me your Champion.